BlogIs Peanut Butter Toxic for pets? My dog loves peanut butter..... is it safe? We often get the question whether peanut butter is safe for pets- the short answer is… generally- yes. 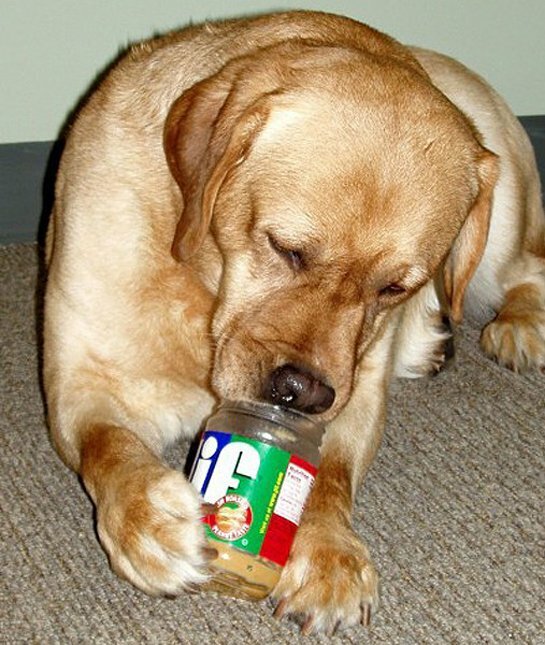 Peanut butter is a great reward for behavior modification and training and is often used in Kongs to keep dogs busy and occupied. The only peanut butter products that are considered unsafe for pets are those containing xylitol. Xylitol is an artificial sweetener often found in sugar free products (think gum, mints, chewable vitamins, nicotine gum, and other diabetic friendly products) that is safe for humans but very toxic to dogs. Dog’s bodies treat it as an overdose of sugar and sends the pancreas into hyperdrive to produce dangerous amounts of insulin and dogs succumb to hypoglycemia (low blood sugar) and liver failure. 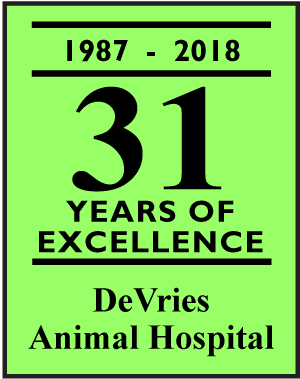 In the cases we have treated at DeVries Animal Hospital the effects of xylitol are dramatic and immediate. If you ever suspect your pet has ingested xylitol containing products, seek immediate care for your pet. The good news is that there are actually very few peanut butters on the market containing xylitol- current brands include Nuts ‘n More, Krush Nutrition, Protein Plus PB and P-28 foods. A survey of the grocery and health food stores in Elmhurst found NONE of them carrying these brands. Only the Vitamin Shoppe in OakBrook Terrace was found to carry Nuts ‘n More brand with Xylitol. These brands can, however, be found online at Walmart.com and Amazon.com. An interesting note- Erythritol, the active ingredient in the artificial sweetener Stevia, is NOT considered to be toxic to dogs. Both erythritol and xylitol belong to a class of compounds called “sugar alcohols” and are considered natural sweeteners normally found in small amounts in fruits and vegetables. Specific sugar free products containing xylitol include the following gum products: Mentos, IceBreakers Ice Cubes, and Orbit. If you have any questions about xylitol toxicity, please call DeVries Animal Hospital at 630-833-7387. If you think your pet has ingested any of these products, IMMEDIATELY contact an Animal Poison Control Center- several exist. We recommend the ASPCA National Animal Poison Control Center at the University of Illinois at 800-548-2423 or 888-426-4435. A veterinary toxicologist will be able to help you determine if the product your pet ingested is toxic and if you need to seek medical attention for your pet.